Expand your No Thank You, Evil! adventures with fun new monsters and other creatures! No Thank You, Evil! is a family friendly story telling game for all ages from Monte Cook. Thanks to it’s easy to learn mechanics and fun artwork it is an awesome way to introduce kiddos to the joy of RPGs. Each player starts with a character card, and games are built around a predicament presented by a guide. 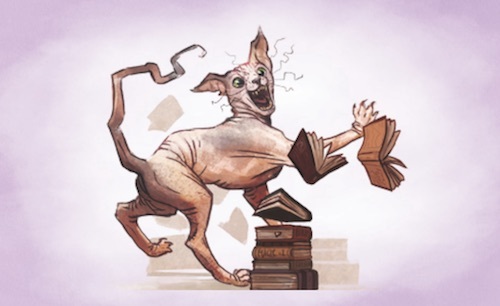 Players let their imaginations run wild creating their own stories all while solving problems, cooperating with other players, and interacting with colorful characters… and in this expansion: monsters and wondrous creatures! Pre-order is available through retailers now; it will be released in late June. The cards are laid out like the ones in the core set – with a unique piece of art on one side, and descriptions and stats on the other. The art used in all of the materials is fantastical and colorful – it’s one of my favorite parts of this game. Each new creature holds endless possibilities for players’ imagination. 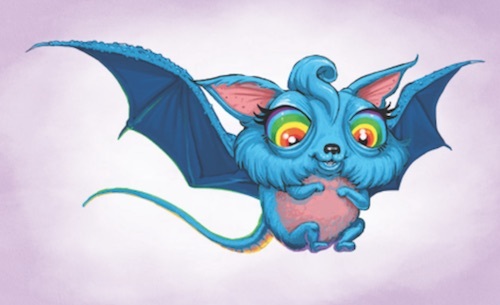 Shield yourself and your companions from the yowls of a Cattywampus while retrieving a magical tome; hypnotize a Bunnyfu to sneak into a forbidden garden filled with carrots that will give you super powers; or make a new friend that just so happens to be a Rainbow Nibbit. It’s all up to what you create – the cards just give a starting point! 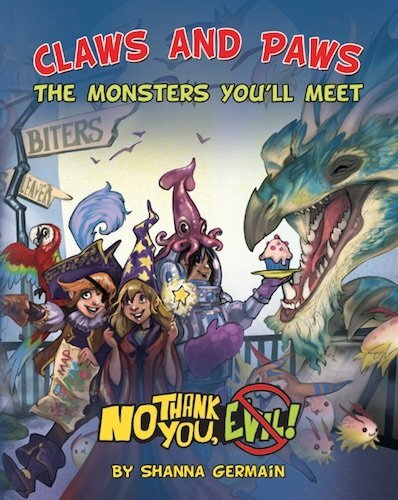 Get even more monster ideas with the Claws and Paws: The Monsters You’ll Meet! source book. Discover all types of new creatures from Storia – monsters, robots, aliens, and more. Explore the Monster Museum with new mini-quests, and discover how to make monsters of your own design that you can use in your games. It’s a handy resource for guides that lays out monster basics, and gives ideas on how to use creatures in games. 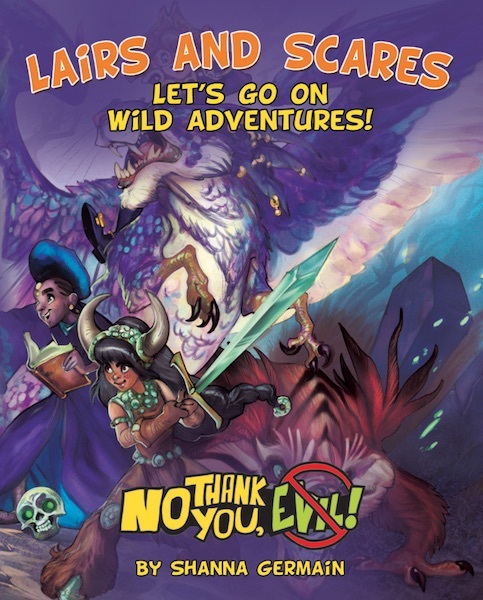 Lairs and Scares: Let’s Go on Wild Adventures! 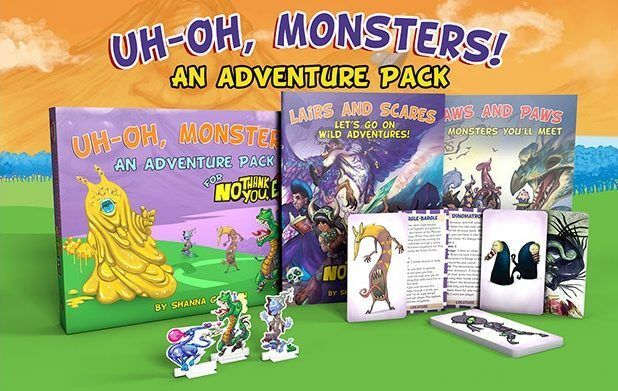 contains three new adventures each with a monster themed conundrum for players to solve. One of the cool things about this system is that kids can learn to guide their own games – no grown ups required. This adventure book is a great step by step to learn how to guide stories. It provides structure for first time guides that will give them confidence to run a game, and hints on how to make games their own. If you’re already playing No Thank You, Evil! this is a great expansion to pick up. If you aren’t playing yet, get started! Social games like this help kiddos develop communications skills, gain confidence, and help build language skills. The benefits of playing RPGs are numerous for developing brains and personalities. Pass your GM talents on to your kids – they’ll have a blast running their own games using this system. You can find our review of the core set here and the Story, Please! expansion set here. Who will you be and what stories will you tell in your Storia adventures?